At CairnsBlog we know what it's like to be the underdog. So we thought we'd do our bit to help a struggling newspaper. Over the last couple of weeks, our beloved local rag has taken out a full frontal attack to boost it's dying subscriber base, and an effort to please it's dwindling advertisers. Just a year ago, the weekend real estate section used to be over 80 pages: it's now half that, in what was a cash cow for NewsLtd. Local real estate agents say that most buyers these days will surf the internet to research and seek the properties they are looking for. Many will take their mobile phone and search on the go, even to locate full information about the sale property while at the site, making a printed newspaper redundant. So the Cairns Post has taken out a number of full pages over the last while, including today's edition, in an effort to get people back. However, asking for a whole dollar for up to half an entire paper of advertisements, even in the first news pages, is a bit rich don't you think? 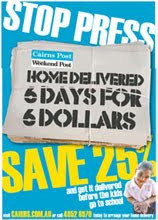 At CairnsBlog we wish them all the very best in the dying days of the printed newspaper. Someone should really book them in to the nearest hospice and pop on a drip feed. NB: Click on the picture above for your special offer.